Spoleto is a walled medieval hill town in central Italy's Umbria region. Inhabited since prehistoric times, the lower parts of its wall are from the 6th century BC. The first Roman settlement, Spoletium, began in 241 BC and there are Roman remnants throughout the historic center. The town is built on a hillside with most of the sites in the compact upper town. Above the town is a medieval Rocca and spanning the deep gorge to one side of the Rocca is the most famous sight, Ponte delle Torri or Bridge of Towers. Spoleto is one of the largest towns in southern Umbria. It's about an hour southeast of Perugia, Umbria's principal city, about 90 minutes east of Orvieto and the A1 autostrada. Spoleto is on the main road (SS 75) that runs down the Valle Umbra from Assisi. There are several parking lots outside the walls from where you can walk into the center. If you're driving, be careful of restricted traffic zones in the center. Spoleto is on the Rome - Ancona train line and the train station is about 1 km from the lower town. You can walk or take a bus that connects the station to the upper part of town. The town is also connected by bus to other towns in Umbria. Two highly rated 4-star hotels are Palazzo Dragoni Residenza d'Epoca near the cathedral and Hotel San Luca on the edge of town near the amphitheater. See more Spoleto hotels on Hipmunk. There are excellent restaurants in town so it makes a good base for exploring southern Umbria towns such as Assisi, Orvieto, and Todi. Country houses, such as Valle Rosa, and agriturismo accommodations are available outside of town, too. Ponte delle Torri, Bridge of the Towers, is a 14th-century bridge built over the foundation of a Roman aqueduct. The bridge is about 750 feet long and at the highest point, it's 262 feet above the gorge. Across the bridge is a small fortification tower. You can usually walk on the bridge for breath-taking views of the valley and gorge below. Rocca Albornoziana, near the bridge, sits on the hilltop above Spoleto. Currently, you can visit only with a guided tour. Tours are given about once an hour and some English tours are scheduled daily, check at the ticket office. A shuttle bus takes you to the entrance where you'll also have a nice view over the valley. 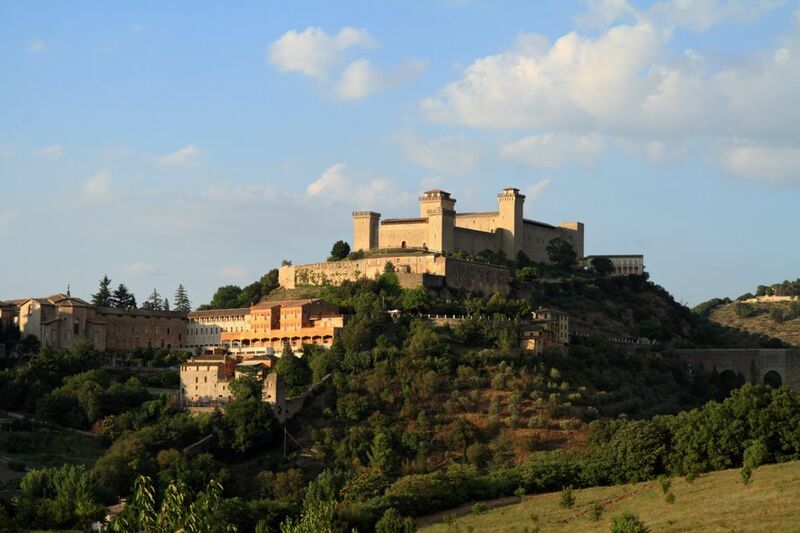 Rocca Albornoziana was built on the foundation of the Roman acropolis in the 14th century and served as the seat for local pontifical governors. It has six towers, two large courtyards, and some beautiful frescoes. Inside there's a museum and during summer there are often performances. Piazza del Duomo and the Duomo are at the foot of a scenic stairway. Erected on the site of a primitive Christian temple, the original Duomo was built in the 12th century. Its Romanesque facade was remodeled during the Renaissance and now has a beautiful pink stone, 8 rose windows and gold mosaics. Above the entrance is a Bernini bust of Pope Urban VIII and there are some good 15th-century frescoes in the apse. The Teatro Caio Melisso, one of Italy's first theaters, is on one side of the square. Piazza del Mercato, one of Spoleto's central squares, was once the site of the Roman Forum. There's an interesting fountain built 1746-1748. Around the square, you'll find bars, gelato, and some restaurants. The Roman Arch of Drusus, built in 23AD was the entrance to the Roman Forum. Nearby is an ancient temple under what is now the Church of S. Ansano. Casa Romana, the Roman house, is just above Piazza del Mercato. The Casa Romana is believed to have been the house of Vespasia Polla, mother of Emperor Vespasian who was responsible for building the Roman Colosseum. The house is built around an atrium and has mosaic floors and traces of frescoes. The Roman Theater was built in the first century. Combined with the theater is the Archeology Museum with Bronze age, Iron age, and Roman exhibits. The theater is now used as a venue during the Festa dei Due Mondi. San Salvatore Church, outside the city walls, dates from the 4th century and is part of the World Heritage site, Longobards in Italy. The main tourist office is in Piazza della Liberta, a large square in the upper town. Here you can buy a discount combination ticket to see the Casa Romana, the Museum of Modern Art, and the Pinacoteca Comunale. Next to the tourist office is an office that makes hotel reservations. Spoleto hosts the famed Festival dei 2 Mondi, an international festival of music, art, and performances that runs from late June through mid-July each year.